Despite my earlier predictions of a break, I dove (drove? chugged?) right back into Sunless Skies. 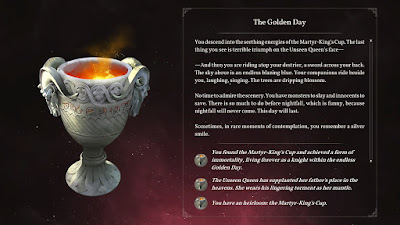 This time I was pursuing one of the two "story-based" ambitions, The Martyr-King's Cup. (There is a good amount of story for Wealth, and a surprisingly large amount of story for Song of the Sky, but The Truth and TM-KC are primarily billed as story ambitions.) This is a somewhat unusual ambition in that it can be failed: if you lose at some specific challenges, the ambition terminates prematurely and you are forced to choose another. In some ways, this is worse than death: if you take too much damage or incur too much terror, you have the possibility of reloading or save-scumming, but if you fail in the ambition, there is no recovering. Partly because of that, I opted to do TM-KC first, even though I suspect The Truth is intended as an easier/earlier challenge. Since I've already completed Wealth and SotS, I figured that if I did fail at TM-KC, I could fall back to The Truth and still get a good campaign out of it. Fortunately, such scheming was unnecessary: I was able to successfully complete the ambition on my first try, woohoo! It was a very close call, though: at one point I faced a Veils check with only an 18% chance to pass, and was convinced that I was going to lose, only to be amazed when the RNG smiled on me for the first time in my life. Not wanting to push my luck, I passed on an 82% Iron chance that would have given me 8,000 sovereigns if I won, but ended the ambition if I lost. I'd mentioned that I couldn't find the transit point to Eleutheria. That's because, despite me somehow being convinced that it was in Albion, it is, in fact, in The Reach. That did make sense in retrospect, and I now think of The Reach as being a kind of crossroads rather than the hinterlands. After all, you start your lineage outside the Blue Kingdom transit relay, and the Albion relay is there, so why not Eleutheria as well? It took me an embarassingly long time to figure this out; I finally realized my error after recruiting the Fortunate Navigator for, like, the third time, and noticed a small note at the bottom directing me to Hybras in order to locate the relay. 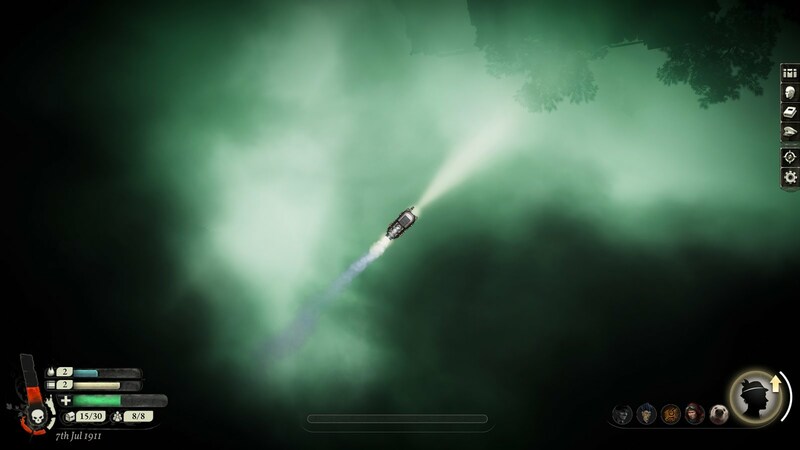 Of course, that was the one area of the Reach that I had not thoroughly explored: in my game, Hybras is far from any sources of fuel or supplies, and I had no compelling reason to go there. Before now, at least. Similarly, I had multiple Captains with the mistaken belief that Eagle's Empyrean was located in Albion, and that I was just terribly unlucky in never getting a Prospect for it. I have a better idea of where this idea came from: on my first visit to London, both the Fortunate Navigator and the Firebrand Conductor directed me to the Empyrean, so of course I assumed that it was in the region. 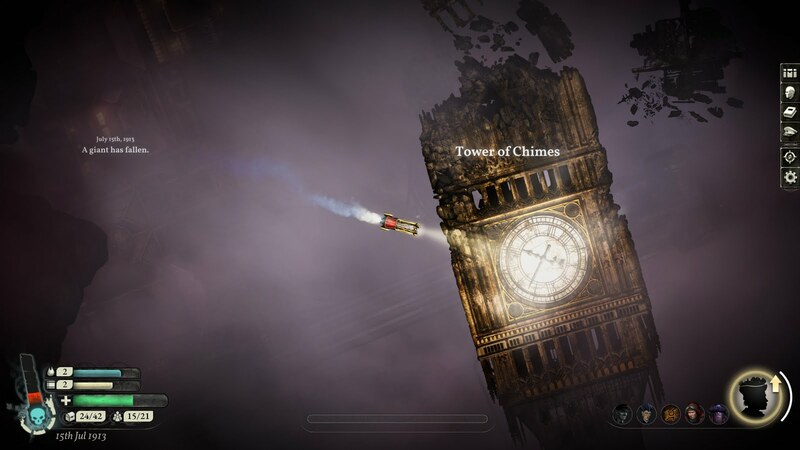 As a side note, the Empyrean just might be my favorite port in the game. Much of Eleutheria is ominous and forboding, and Pan is a rather unpleasant central hub (though more exciting than New Winchester), but the Empyrean is a (literal!) bright spot in that dark region. I absolutely love the music, too; that and the lore remind me of some of my favorite bits of Sunless Sea, and it's really nice to see that carried forward into this game. Anyways! Like I was saying, I looked it up and, sure enough, there are plenty of ways to get Captivating Treasures. The most easily repeatable way is to kill a Guest, who will often drop one as loot. I always "NOPE! "d out of there whenever I ran across a Guest, but now that I've built up my equipment, they're pretty easy and profitable to take down. 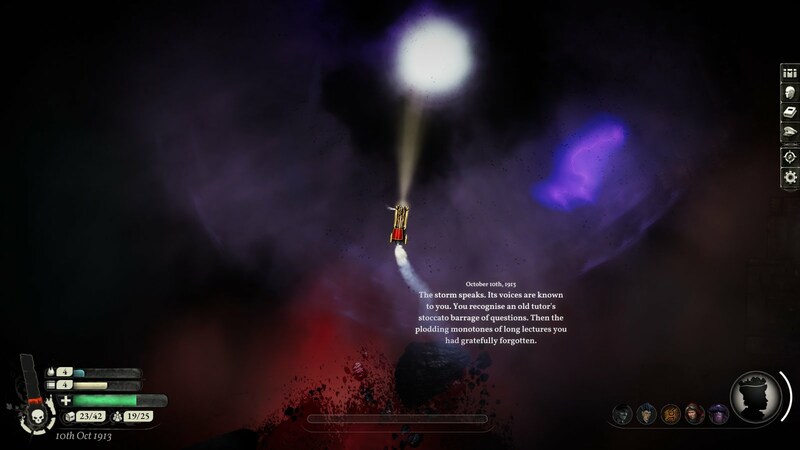 I smacked myself in the head when I found an easy early-game way to get one: when turning the Spirifer over to the Presiding Deviless at Carillon, as for a substantial reward. That's the one outcome I haven't chosen in all my playthroughs, and it seems so obvious in retrospect that it would grant such a treasure. Incidentally, the relative rarity, usefulness and value of each type of item is very inconsistent. Searing Enigmas are the most expensive Academic item, but I always end up with, like 8 or 10 of them by the end of the game without trying for any, and usually only find around 2 or so Condemned Experiments, which are only worth half as much. But on the Bohemian side, I get dozens of Moments of Inspiration, and few or no Captivating Treasures. Crimson Promises are valuable, but seem completely useless; I think they are options for some of the Fortune endings, and don't recall ever seeing another use for them. Searing Enigmas and Moments of Inspiration get tons of use, while Condemned Experiments and Captivating Treasures get very few. I dunno, it's strange. One final correction/update for the record: as is my wont, I whined a bit about limited romance options. There are more than I'd initially thought; by my count three of the nine officers are romanceable. The ones who aren't romanceable include a gang of talking rats, a book, and your aunt, each of whom would be taboo for their own very distinct reason. What I really wanted to talk about, though, is that I hadn't initially grasped just how many of your officers are transgender or nonbinary. Failbetter consistently does a wonderful job at representation, and Skies is no exception; one of the coolest aspects is that there are multiple trans people in your crew, who have very distinct experiences. As a result they never feel like tokens or stand-ins, but as fully-realized people. I imagine that writing romances for these sorts of characters is potentially even more fraught than usual, and I'm impressed that they did include at least one, with the Felined Eccentric making a dramatic appearance in my most recent game. On to the plot itself! So, The Martyr-King's Cup is basically a Terry Gilliam movie in video-game form, and therefore it's one of my favorite things ever. It absolutely nails the wonderful slippery sense you get from his best movies, crossing between the mundane and the fantastical worlds, having a heightened sense of destiny and importance to what may actually be a delusion. This builds and unfolds terrifically over time. 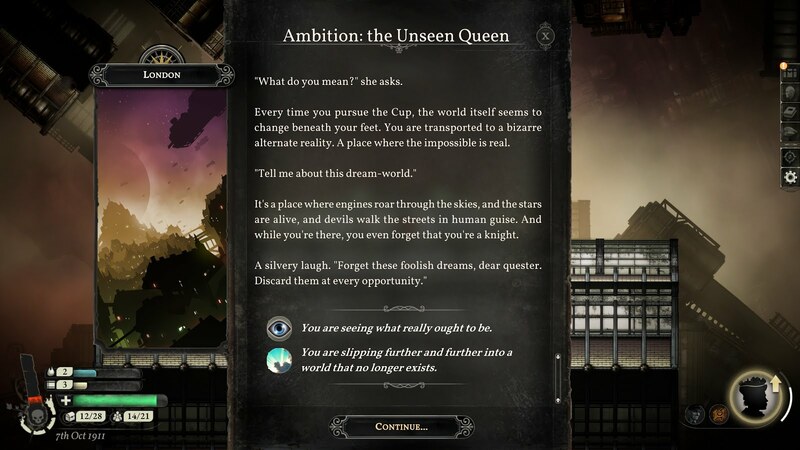 You start out with the quest itself: investigating rumors of a chalice that grants immortality, finding a realm hidden beneath London, meeting the Unseen Queen and her retinue. As the story continues, you get a sense that something isn't quite right. Cleverly, this has a strong mechanical component: by passing a Mirrors check, you can discern that you are witnessing an illusion. You're standing in a decrepit sewer, not a subterranean castle. You're surrounded by rats, not retainers. The Queen is a filthy old portrait with its face slashed out, propped up on a broken chair, not a resplendent throne. As you continue along the stages of this Arthurian quest, you can pivot back and forth between these perspectives. It's really fun! And useful! Like, you may be facing a vigorous knight wielding a broadsword in mortal combat; but by passing the Mirrors check, you realize that it's just a clerk waving a fountain pen at you, and that's much easier to beat up. On the other hand, you may be trying to cross a rickety narrow bridge strung between two towers and need to pass a daunting Iron check to avoid failing the quest... or you can slip into the moonlit world, convinced that you are a fearless knight, and confidently stride across without hesitation. Like those movies I love, the sense of reality grows increasingly muddled. For quite a while there's a good working thesis that the mundane world is "real" and everything else you see is a hallucination or spell or other artifice; as time goes on, though, you start seeing snatches of those other visions even while you are supposedly in control of your senses. Scruffy robbers may briefly flicker into demonic forms, and that portrait is still speaking to you even when you see the rats. Over time, doubt begins to set in. Is it possible that the moonlit world is, in fact, the real one? 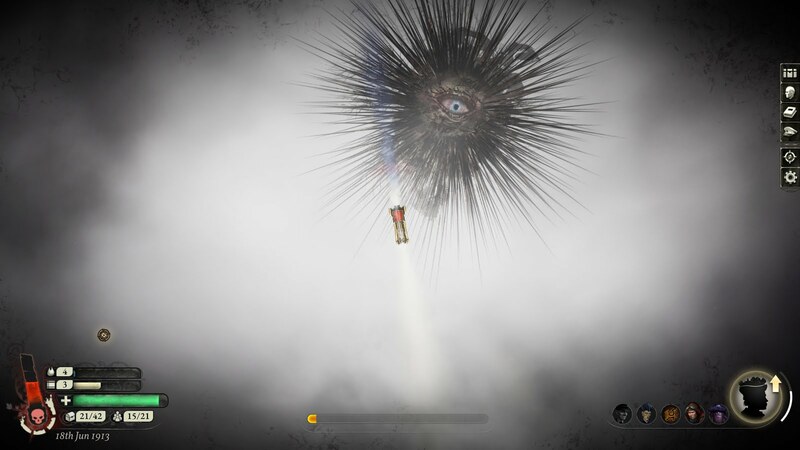 After all, this is a video game I'm playing: why am I acting like the world with space choo-choo trains and exploding Correspondence sigils and sentient tea leaves is a "mundane" and "realistic" world? Isn't it at least possible that, within the world of the game, "reality" is a fantasy quest, and these visions of voyages between the stars are just dreams? This wonderful duality carries through all the way to the very end. There is a huge and very satisfying lore dump near the end. Failbetter's style is typically to hint and allude to historical events and leave you to connect the dots yourself, but in this particular quest you are rewarded with a surprisingly detailed explanation of the Storm the Speaks, the death of the King of Hours, the Unseen Queen and various other major players and events in the game. At the very, very end, your available choices are shaped by how you have experienced the story thus far. Depending on how often you have experienced the moonlit world, versus how much you stay rooted in the world as it is, you can lock or unlock various choices. In my case, I was just barely enough on the fantastical side to embrace the world as it ought to be, and turn my sci-fi game into a fantasy game at the very end. Intendant Lloyd, an Auditor with the Ministry of Public Decency who retired to a life of Wealth in London. Lady Sybil, a Celestial Poet who wrote the Song of the Sky. Professor Lydia, a Scholar of the Correspondence who went insane and found that Martyr-King's Cup. 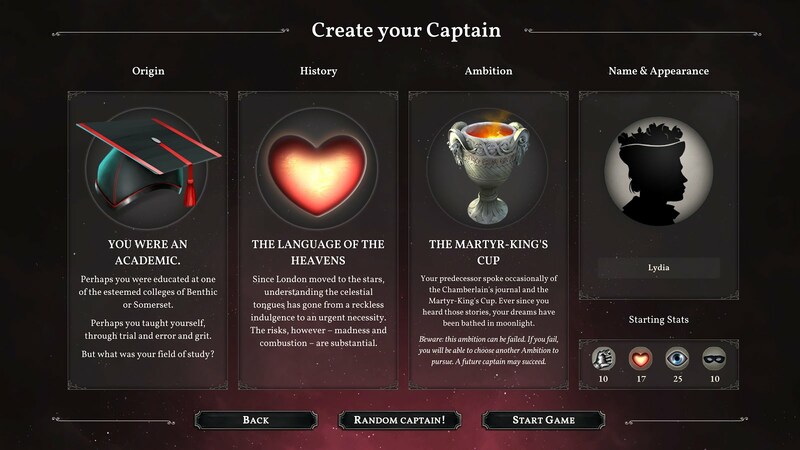 All of my captains' builds have been fairly similar so far: I emphasize Hearts, with either Mirror or Iron close behind, then catch up the other once the other two are at 75. Veils is a persistent dump stat that maxes out around 20 or so at my max level. For a while I was feeling like the game incentivizes you to replicate builds like this, since you can inherit equipment that has a usage requirement, so if you want to outfit the gear you've already got you need to hit the same stat levels. But now that I've gone so far along on this lineage, I'm consistently passing down significant dowries on each new captain, so I think I can afford to, say, finally make a Veils-heavy guy and pick up the stuff I need. And finally check out how smuggling works! That's still a ways off, though. In the meantime, here is my current end-game loadout. Engine: Mandos, the Moloch-class liner. I love the built-in storage and many Bridge slots. My biggest gripe is how slowly it turns, which makes it poor in combat, but I don't fight much and can take decent punishment when I do. Front weapon: The Wrath of Heaven, a powerful (Hearts-based!) missile that is very On Brand for my Scholar of the Correspondence. Does immense damage to enemies, but is also risky: it does burst damage, which makes it more harmful than good when enemies spawn at discoveries. Rear weapon: Wit & Vinegar Zounderkite. A great mine. I think it has a wider trigger radius than the Sneeze-lurker. I rarely destroy enemies with this, but I'm pretty sure it staggers them, which is all I ask for when I'm trying to leave. Plating: The Watchers in Azure, an Assaying device that also gives decent armor. This was the first level-75 upgrade I purchased, and maybe still my favorite, totally worth the early visit to the Blue Kingdom. Scout: Cyclopean Owl. I feel really bad for players who didn't back the Kickstarter, I've tried out some of the other scouts and they all seem notably inferior. Auxiliary 1: Osiris, a great Royal Society invention that gives Butchery and Hold. I love Hold! Having surplus Hold has been game-changing, and I squeeze it into every slot I can, as you will soon see. Auxiliary 2: Canktankerous Boring Rig, another Royal Society invention, this one giving Mining and, yes, Hold. And even a little Hull as a bonus! Bridge 1: Fitted Cupboards. Extra Hold at a reasonable Iron requirement. Bridge 2: Fitted Cupboards. Keep 'em coming! Bridge 3: In this screenshot it's an Adjustable Infirmary, for more Crew, but honestly I think I'm going to swap it out for more Fitted Cupboards on my next captain. Even without it, there's plenty of Crew space on the Moloch. There doesn't seem to be any benefit to keeping more than 12 crew, and even that is only occasionally useful, mostly in Pan; you'll "spend" some crew in The Reach while doing quests, but they're cheap and easy to replace and there's no need to stock up. I haven't tried the other top-tier ships yet, so I may also try those on a future captain, but I have a really hard time imagining giving up all of my Hold. It's really changed the way I play the game. I just go wherever I want to go to pursue my Ambition stories, crew plotlines, etc. Along the way I buy up every Bargain I find. The next time I come to a central port I check my bank, deposit items if I'm running low on a particular stash, and otherwise liquidate everything I got. 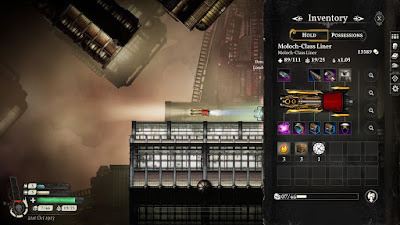 It isn't quite as profitable per-item as focusing on Prospects, but it makes the game feel a lot faster since you're just focusing on the main plot, and you can do enough volume to make up for lower margins. Then again, if I do try a Veils captain in the future, I'll be focusing on trading of another kind. It'll be interesting to see how short-haul high-pressure opportunities compare to my current existence as a market maker. That was a profoundly satisfying ending! I've been happy with all the conclusions so far, but this one is definitely my favorite. It makes me eager to check out The Truth and get another long-form plot set in this world. Again, I think I'll try and take a little break; there have been some very helpful bug-fix updates over recent weeks, and some allusions to upcoming content updates, so I might wait for a more substantial patch before my next thorough voyage. Then again, I wasn't expecting to dive in so soon on this ambition, and certainly do not regret having done so. We will see what the future holds! Hopefully more space trains!